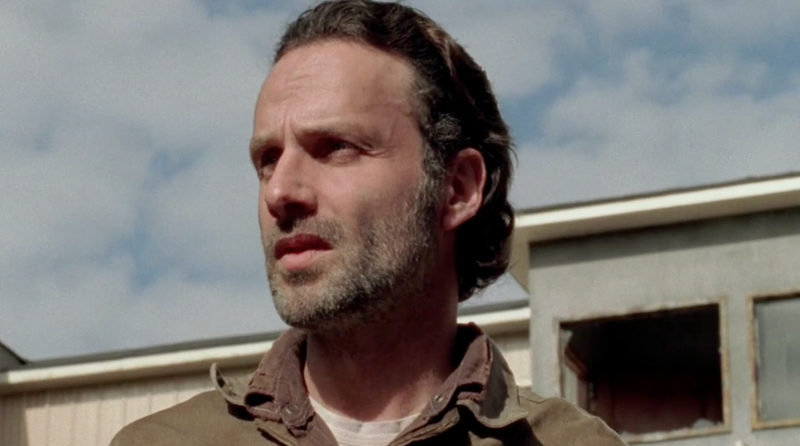 Six months have passed since the Governor's attack. 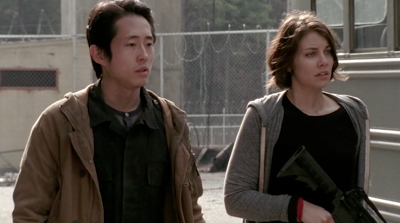 The Prison Group has thrived despite the constant threat from Walkers. 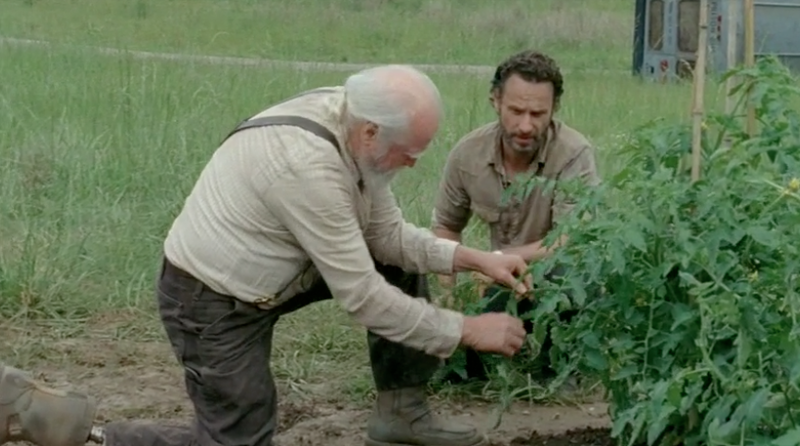 Hershel Greene has instructed Rick Grimes in the art of working the land around the prison. Their hard work has off and soon, crops of tomatoes, corn, squash and cucumbers are ready to harvest. They even have a farrow of piglets as an additional food source. 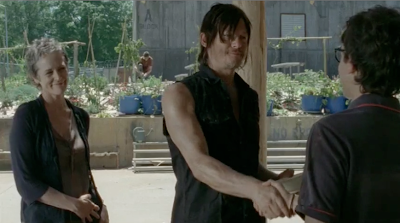 To his horror, Daryl Dixon has become a minor celebrity among the grateful newcomers, including a doctor and families. He is greeted each morning like a star. A young man named Patrick in particular makes a special effort to show his gratitude. 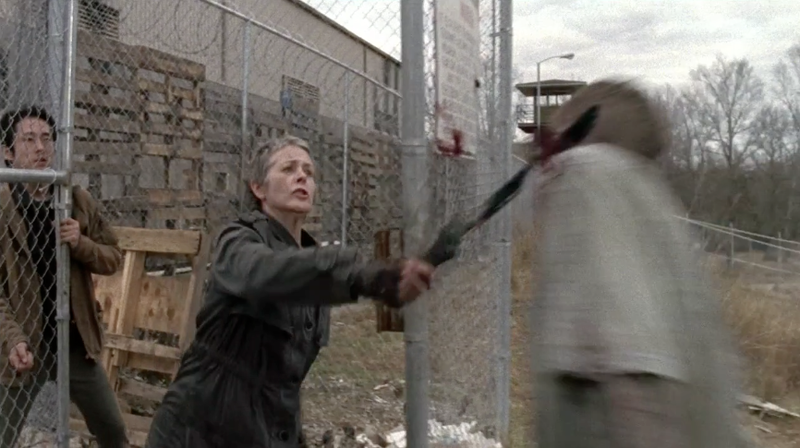 Carol has taken on the huge task of instructing the children in self-defense. 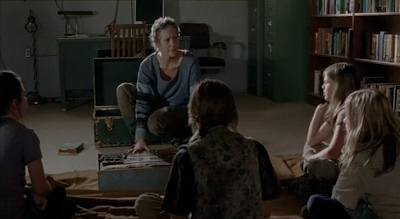 Remembering how unprepared her daughter Sophia was to survive; she makes sure even the most reluctant children attend and pay attention. Glenn and Maggie struggle to have a "normal" relationship in the midst of all the sorrow. Tyreese and Sasha have proven their value, both as dedicated fighters and moral leaders. 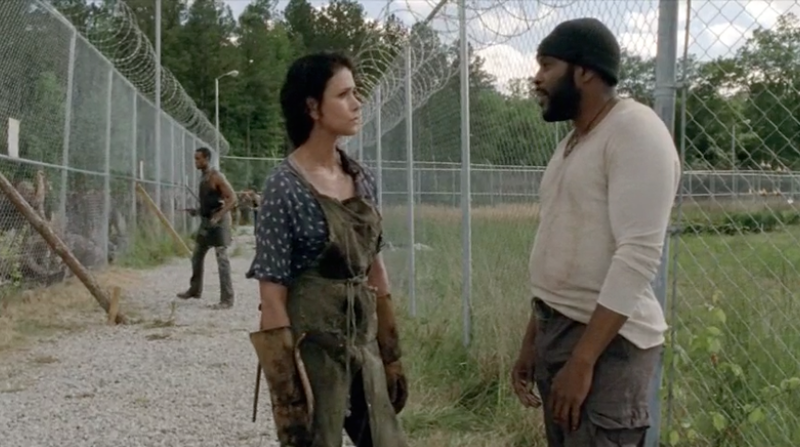 Tyreese has even won the heart of Karen, the lone survivor of the Woodbury Army Massacre. 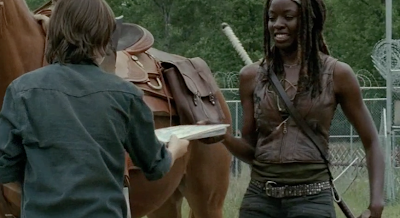 And Michonne continues to leave the prison at regular intervals in her quest to find and punish the Governor as well as find supplies for the Group. Rick has chosen to stop carrying a weapon and has asked that Carl do the same. 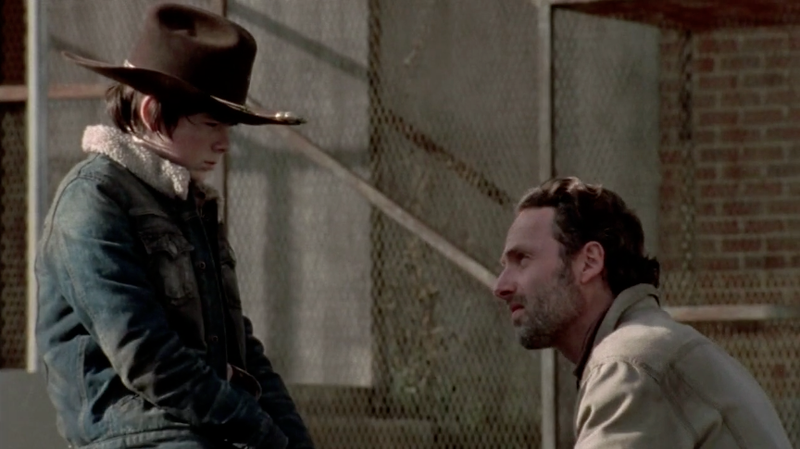 His biggest fear is that Carl will become violent and never recover. 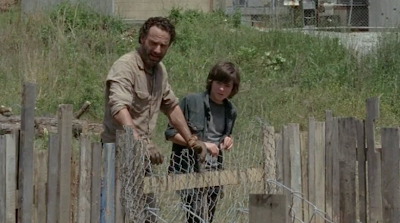 One additional task that Rick does take on is leaving the prison to check the snares. He runs across a woman driven insane by the traumas she has endured. 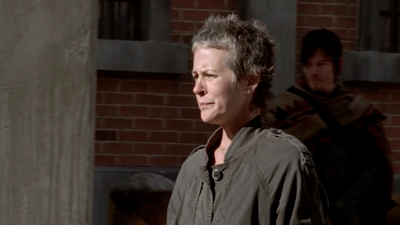 Watching in shock, Rick can do nothing as she takes her own life. He returns to the prison, even more determined than ever to protect his son from madness. 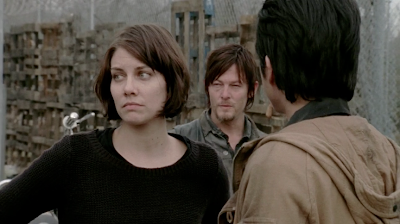 The Prison Group had a huge breakfast that morning. Carol and Patrick got an early start to make the meal together so the group would have fuel for their day. Corn Fritters, a Southern specialty would be fast to prepare and perfect to feed a large group. Although the corn crops would not be ready to harvest for a few more weeks, canned corn would work just fine. 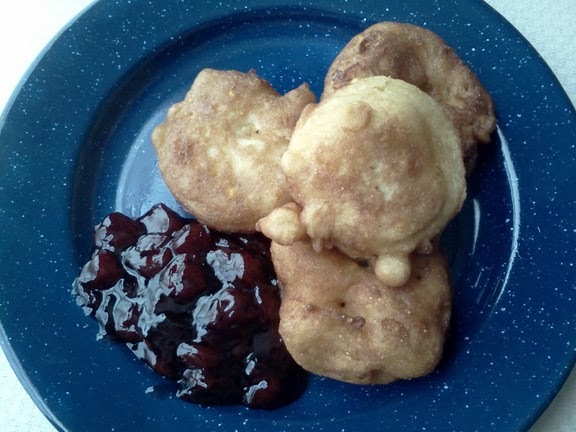 Served with cherry jam (or whatever flavor you find), corn fritters would also be a fin accompanyment with Daryl's leftover venison or whatever meat your group can scavenge. 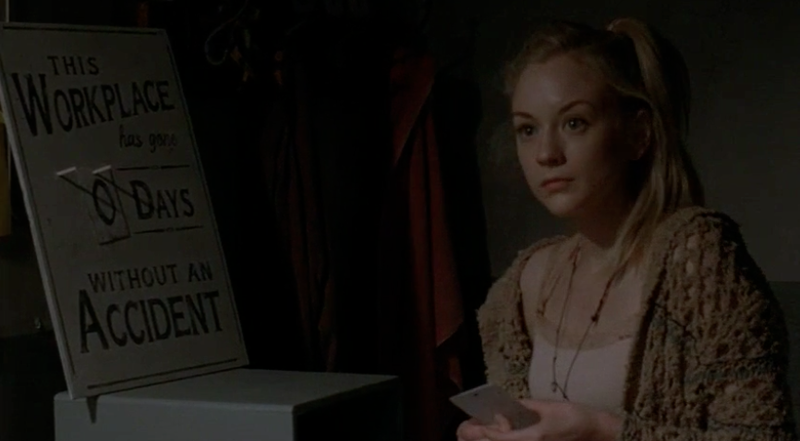 And when the dead rise; don't hand out perfectly good sandwiches to total strangers without asking The Three Questions first! 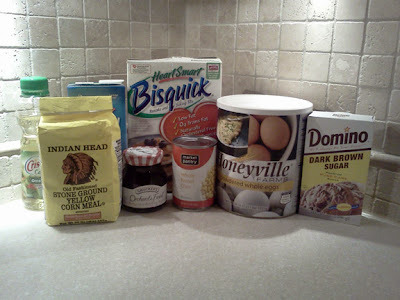 In a large bowl, combine buttermilk baking mix and the next 5 ingredients and stir until just combined. Do not over mix. Heat 2 inches of oil in a very heavy skillet or Dutch oven over medium heat or medium campfire coals. Heat oil until temperature reaches 350°F. Drop the batter by a 1/4 cup measure into the hot fat. Fry for 1 to 2 minutes. Using a fork or metal tongs, flip fritter over and fry for an additional 1 minute. Remove from the oil using a slotted spoon and place on a towel to drain. Serve warm with melted cherry jam or any flavor you wish. Corn fritters may also be served with powdered sugar or maple syrup. The next morning brings fresh hope along with the sunrise. The sound of Daryl's motorcycle and Rick's truck is music to the Group's ears. Maggie and Glenn race to the gates to let them enter. 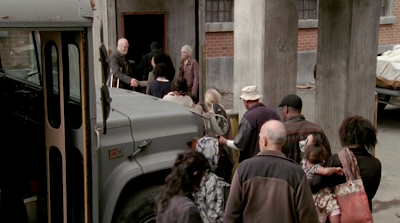 The entire Group emerges from the prison and are surprised to see a bus at the rear of the caravan. 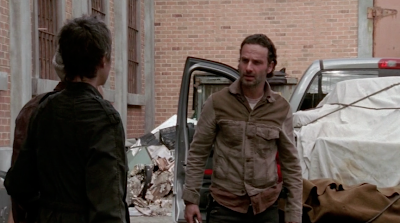 Rick climbs out of his truck and confirms that the wrapped body in the bed of his truck belongs to Andrea; who died at the hands of the Governor himself. 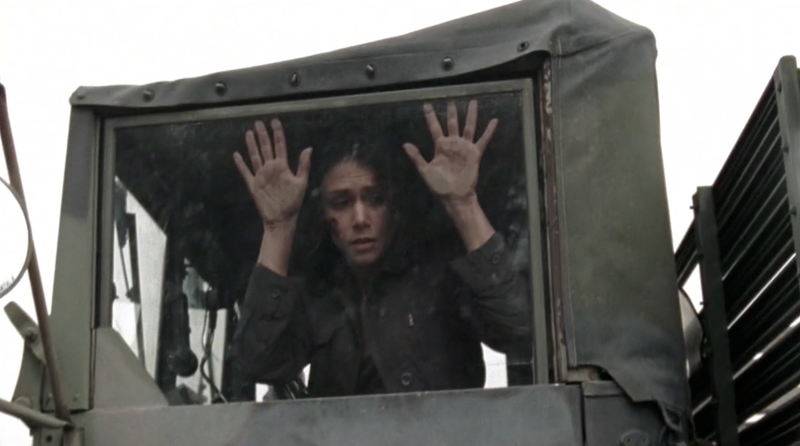 Michonne sits, understandably heartbroken in the cab. 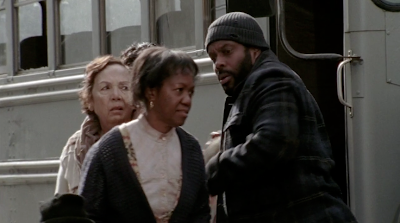 Carol, Hershel, Beth, Maggie and Glenn all watch together as Tyreese and Sasha exit the bus. The two turn and begin assisting even more people as they disembark the bus. It is the entire group of Woodbury. The Governor would have been quite content to leave them all to die in the small unprotected town. But as Rick has finally realized…he is not the Governor. He is still the Sheriff's Deputy who has sworn to protect and serve. The end of civilization has done nothing to change that. As Tyreese and Sasha, flanked by the elderly and the very young (and their mothers) enter the prison, they are warmly welcomed by Hershel and Beth. No doubt the sight of dozens of more mouths to feed would cause at least a moment of panic within the Group. But Michonne and Daryl planned ahead. Along with all of Woodbury's people, the two practical-minded survivors would have cleaned out the town of all foodstuffs. They would have carefully directed the exodus to include all the provisions and supplies. While their victory has come at a high price, it is still a victory. They are all together and there is great strength in numbers. 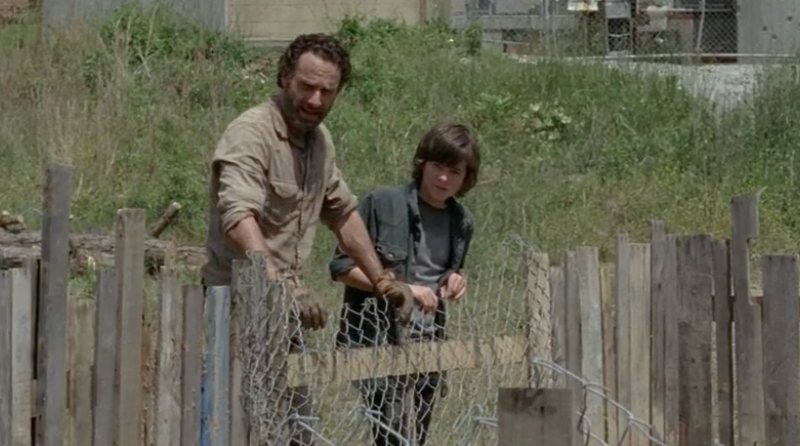 The newcomers may not be battle-hardened soldiers but they can still assist in the fortification and upkeep of their prison home. Everyone has something to offer. The safe return of Rick, Daryl and Michonne and the joining of their two Groups would require a celebratory meal. Inspired by Denny's famous Grand Slam® breakfast, the Woodbury Slam highlights some of the state of Georgia's favorites. Rolled Peaches and Cream Pancakes showcase Georgia's most famous and delicious crop and SPAM Barbecue features Georgia-style barbecue sauce. Scrambled Eggs with Chives (powdered of course) and Hash Browns with Rosemary Salt complete the meal and create a memorable moment for the new arrivals. 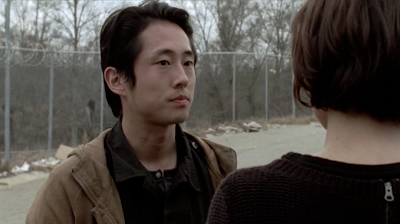 And when the dead rise; Fear No One. And Protect the Living. In a large bowl, combine all pancake ingredients. Stir batter well with a wooden spoon until blended. If there are some lumps, that is fine; it does not have to be perfectly smooth. Melt 1 tablespoon shortening in a cast iron skillet or heavy non-stick skillet over medium-hot coals or medium heat. Using a 1/4 cup measure, drop pancake batter into the center of preheated skillet. The batter is thin and will run, so tilt pan evenly around until a circle shape forms from the batter in the center of the pan. Cook for about 2 minutes on the first side. Using a rubber spatula (metal will work but rubber is better), flip pancake over very carefully. The batter will create a very thin pancake so this may require a bit of practice on the first few. Cook another minute on the second side and then remove from pan. Repeat procedure with the remaining batter. To assemble rolled pancakes, spread 2 Tablespoons of the Peaches and Cream Filling onto each pancake (do not spread closer than 1/2 inch to the edge of the pancake). Roll up carefully and place seam side down on plate. Top with optional melted peach preserves if desired. 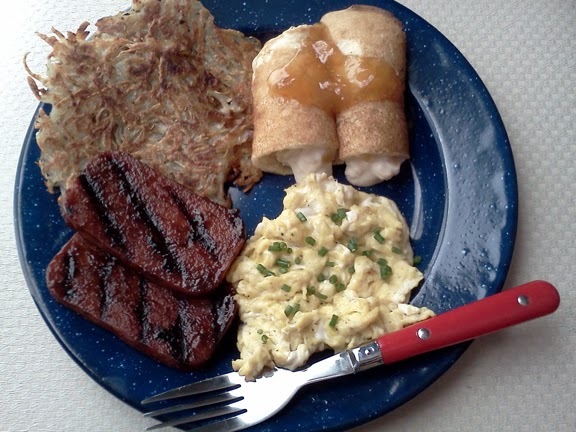 Serve with SPAM Barbecue, Hash Browns with Rosemary Salt, and Eggs. Drain peaches well and mince into small cubes with a sharp knife. Combine with the Pineapple Spread in a medium sized bowl and stir well until blended. In a small bowl, combine ketchup, mustard, vinegar, cayenne pepper, garlic and sugar. Mix well. Place SPAM slices in a flat dish (like a pie pan) and pour over barbecue sauce. Allow to marinate for 10 minutes. Grill over medium-hot coals for 2-3 minutes on each side or until hot and grill marks appear. In a small bowl, combine rosemary and salt. Use the back of a small spoon to grind the mixture together to release the oils from the rosemary into the salt. Set aside. In a medium bowl, mix grated potatoes with salt and rosemary mixture to taste. Pat mixture into small, flat patties (about 4 inches in diameter) and set aside. In a large skillet, heat olive oil, over medium heat or medium coals. Cook grated potato patties in hot fat for 4 minutes on each side (or until golden brown and crisped). When all of the potato mixture is cooked, set aside (wrapped well to keep warm). In the same skillet used for the hash browns, (over medium heat or coals), melt a tablespoon of shortening. Pour in powdered/reconstituted eggs, along with 1 Tablespoon of Chives, and scramble lightly using a wooden spoon or spatula. Scramble eggs until softly set. Remove from heat onto a warmed plate and cover to keep warm. 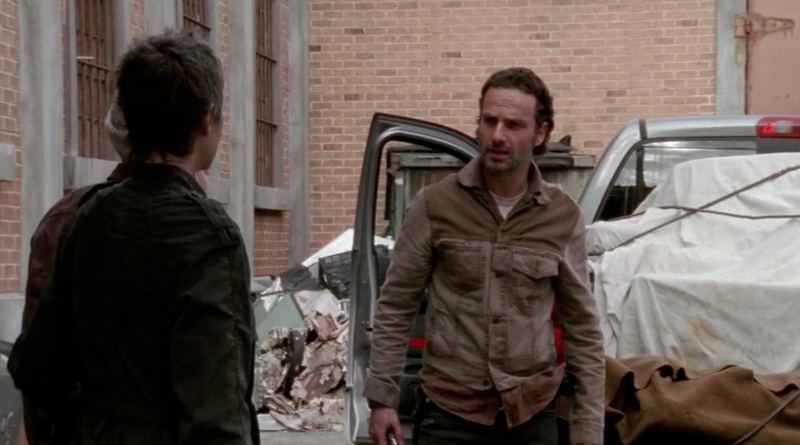 Rick, Daryl and Michonne return to Woodbury and stumble upon a scene of carnage on the way. 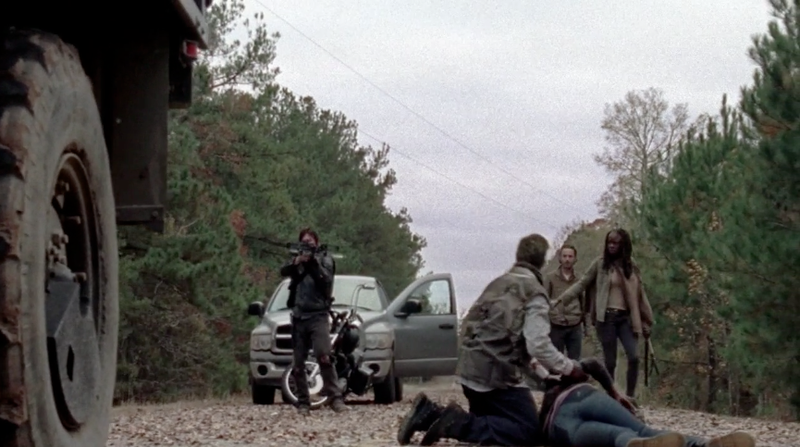 The entire Army of Woodbury lies dead on the road. A few had already turned and were feasting on the fresh bodies. 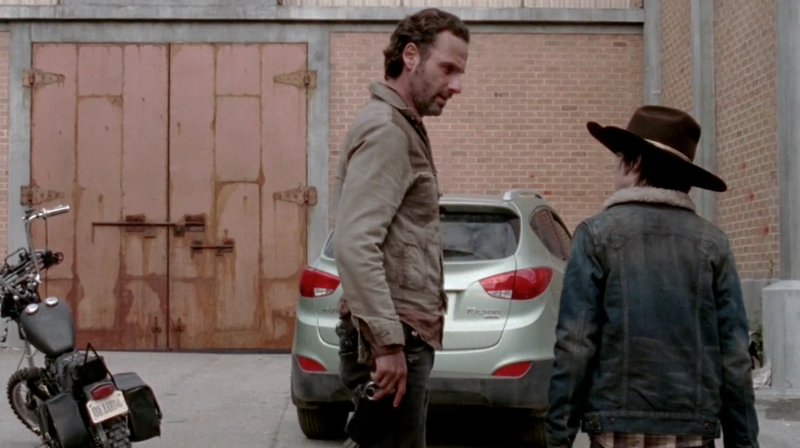 A sole woman named Karen survived and is able to explain to Rick what happened. 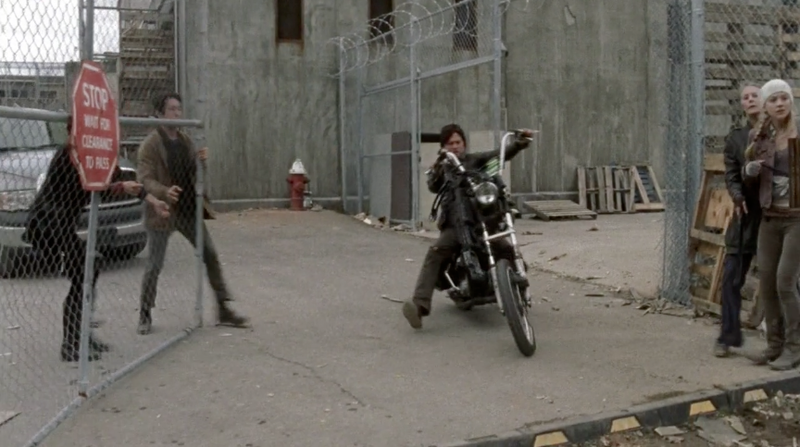 In his fury over the undignified retreat of his army, the Governor opened fire on all of them. 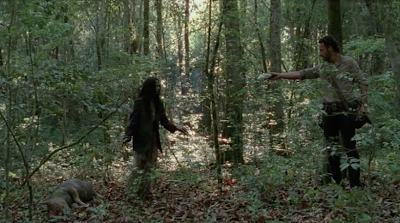 Believing them to all be dead, he left with his two surviving Lieutenants: Shupert and Martinez. Back at the prison Glenn and Maggie are of course unaware of this new development, and return to their positions on the catwalk to keep watch against another surprise attack. 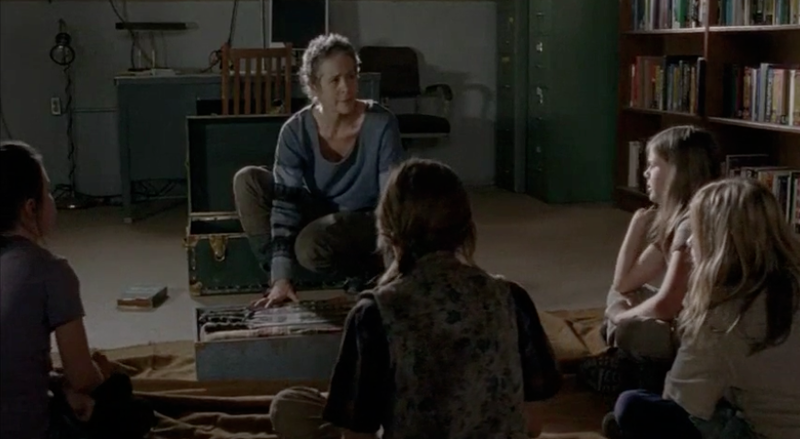 Hershel and Carol would have no idea who long they'd have to wait for Rick, Daryl and Michonne to return. 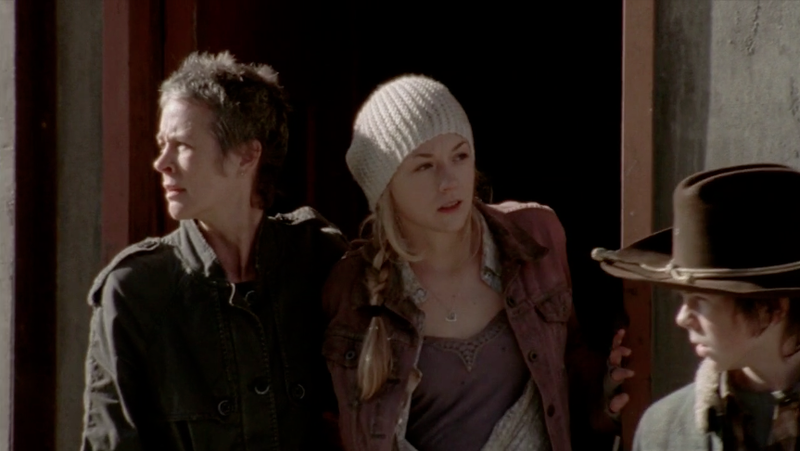 At dusk, Hershel would send Beth out with celebratory dinner for his daughter and future son-in-law; Truffled Linguini. Plain pasta can be almost magically transformed into a gourmet feast with a sauce made from only a few pantry ingredients. 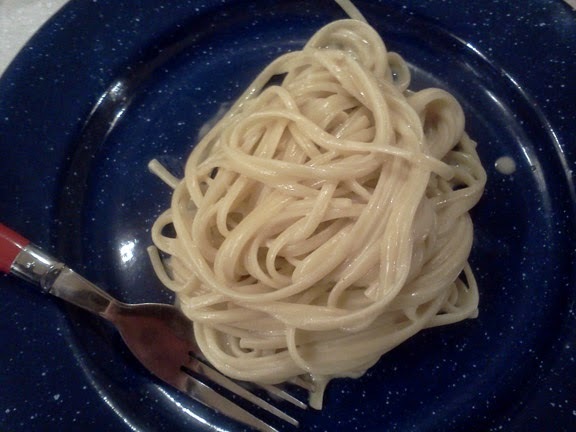 The extra addition of white truffle oil adds a distinctive and unforgettably earthy flavor. Make the effort to grab some if your next scavenging mission takes you to a larger grocery store. Stash it away for a special victory meal and savor your success. And when the dead rise; never turn your back on the Governor…especially if you're on his side. Fill a large Dutch oven or heavy duty stockpot with water and bring to a boil over medium-high heat or medium-hot campfire coals. Cook pasta according to package directions. Meanwhile, in a mixing bowl, combine evaporated milk, powdered eggs, butter-flavored sprinkles, butter-flavored shortening, 1/4 cup of the Parmesan Cheese and 1 Tablespoon of the truffle oil. When pasta is finished cooking, drain well and return to the Dutch oven. 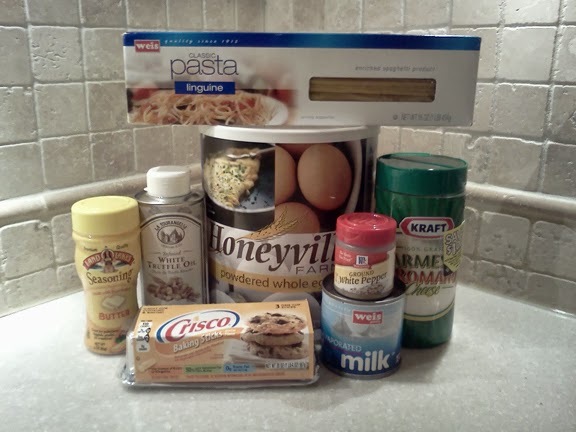 Pour milk and truffle mixture over pasta and stir well to blend. The egg in the mixture will coat the steaming-hot pasta and form a sauce. If it starts to congeal or if the cheese hinders the mixing process, feel free to add a few tablespoons of water and keep stirring until the sauce is smooth and shiny in appearance. Add salt to taste and divide evenly among the plates. Serve right away with the remaining tablespoon of truffle oil and 1/4 cup Parmesan Cheese sprinkled over each serving.